From left, BC Ambulance Service dispatcher Rachel Wardale, Salt Spring ambulance station acting unit head Jazzi Griffiths, Luanne Katz, her husband Ken Katz and Salt Spring paramedic Sean Davids. The group was reunited during a Feb. 1 presentation of a Vital Link award to Luanne Katz, who administered CPR to her husband through Wardale’s instructions on Nov. 11, 2017. Luanne Katz is a well-known name in the North American classical music scene as a skilled percussionist on the marimba and vibraphone. The Salt Spring resident is capable of sustaining full concerts with power and artistry, but last fall she was called upon to find new reserves of strength in a physical and emotional endurance test she never imagined taking. She administered life-saving CPR for nearly 20 minutes after her husband Ken suffered a heart attack in November. 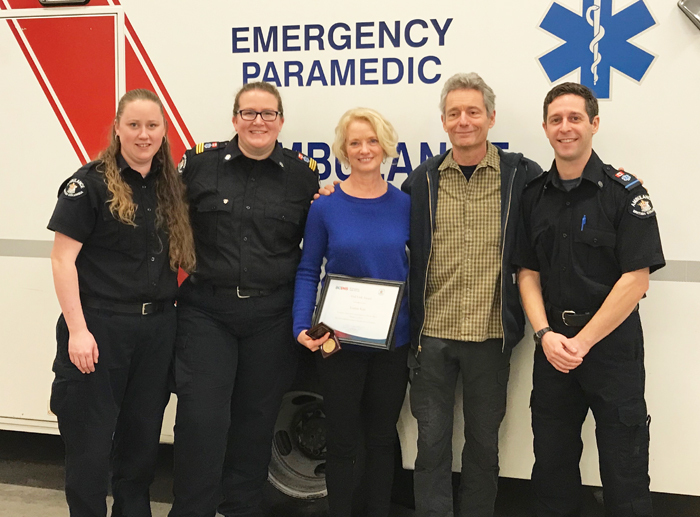 Katz received the rarely given Vital Link medal from the BC Ambulance Service in recognition of the event during a short ceremony held at the Salt Spring ambulance station on Feb. 1. The ceremony was followed by a gathering and open discussion that included many of the people involved during the events of Nov. 11. “I didn’t really have a choice. I really had to do something. So you do it, and to have this reward from it — it is exceptional that we have this happy ending,” Katz said, pointing to her husband seated next to her. As many of the responders pointed out, having the experience of speaking the Katz couple Thursday was unique and welcome. Most of the time firefighters, paramedics and medical teams never know what happens to a patient after he or she has passed beyond their individual stage of care. “It’s a funny business — we go from one person to the next, one person to the next. So to have the two of you here to reaffirm why we do it, and together as a team, is amazing,” said Lady Minto Hospital registered nurse Israel Cohen, who was one of two nurses who worked to stabilize Ken Katz before he was transferred to Royal Jubilee Hospita. For much more on this story, see the Feb. 7, 2018 issue of the Gulf Islands Driftwood newspaper, or subscribe online.